Posted November 8, 2017 by Alec Smart & filed under City Hub, City News. 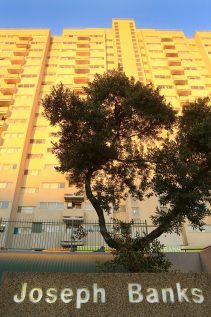 The City of Sydney Council issued a grant of almost $50,000 to the Waterloo Public Housing Action Group (WPHAG), to support them in their attempts to promote a community-led proposal on the future of the condemned Waterloo estate. Councillor Linda Scott moved the recommendation to fund the community group, which was endorsed by the City of Sydney Council. “The community needs to have a voice in the contentious redevelopment process of the Waterloo public housing estate being undertaken by the Liberal NSW state government,” she said. “This grant will assist in that process. In December 2015, the NSW Government announced a multi-billion dollar development proposal to demolish and rebuild the Waterloo public housing estate, including the construction of an underground railway station on the new Metro Line. The Waterloo redevelopment project, still in the planning stages and to be finalised and announced in 2018, will entail knocking down the twin towers at the centre of the estate, the 30-storey high Matavai and Turanga buildings, plus razing four additional high-rise public housing blocks, Joseph Banks, James Cook, Marton and Solander. Richard Weeks, chair of the Waterloo Public Housing Action Group rejects the need to demolish the towers. At a public meeting in August 2017 he said, “Sydney Metro is being built to increase the value of private housing. The Waterloo redevelopment will make way for up to 10,000 homes and an underground railway station on the new Sydney Metro line, the latter diverted from its original route under Sydney University in order to trigger the construction of more apartments. Ultimately the new homes will be 70% owned by the private sector, the remainder geared towards public housing. To enable construction work, up to 4000 existing public housing tenants will be evicted, starting mid next year. The forced relocation raised the ire of public housing tenants, skeptical of the then Social Housing Minister Brad Hazzard’s assurances in 2015 that tenants facing eviction will be given the right to return. Looking at the prospect of years in alternative accommodation – the project will take 15-25 years to reach completion – before the possibility that only a percentage of them might be able to return to a new revamped estate, in February 2016 residents formed the Waterloo Public Housing Action Group. WPHAG and community members then set up the Waterloo Future Planning Centre and enlisted the services of a group of volunteer architects and planning professionals to advocate a community-led vision for the redevelopment of Waterloo. WPHAG is, at its heart, an activist group opposed to the NSW Government’s high-rise housing proposals, and dedicated to a community-based solution that subverts the juggernaut of corporate building constructions being rolled out across Sydney – at least in their own neighbourhood. City Hub put it to Richard Weeks, chair of the Waterloo Public Housing Action Group, that the $50,000 City of Sydney grant they received was like providing a stone to David to take on Goliath. “The grant we got from City Council.. was a community grant for the people here to enable us to do our visioning for the redevelopment. That gave us the [Waterloo Future Planning Centre] premises rent-free and pays for the electricity – winter was quite high for three months worth of electricity, lights, power and so forth. “We’re creating the Waterloo residents’ master plan, involving capacity building and visioning, and lobbying to ensure that all we have here now we expect and accept nothing less than in the new development. This includes community rooms, car parks, secure children’s playgrounds, barbecue areas, and a basketball court that’s used for multiple purposes, sports and theatre activities. And we want to be able to negotiate the type and size of the units that residents get. “These things we are pushing for because these are the requests from the tenants. We are an advocacy for the tenants. We can argue on the non-negotiables as the development goes through, as well as putting up our submissions upfront. We have a large table with a reduced scale model of the Waterloo area with buildings and trees and people can come see the development in process. “Rather than go out on the streets and make a lot of noise or stop the traffic, I wanted to try something a bit different and go in and negotiate something around the table [with the developers]. I believe you talk first and act later. If you act first there’s no talk later because you get people offside. You can’t negotiate around a table after you’ve slapped them in the face, because the trust is not there. “We never asked the state government for funding, for the simple reason we’d be bound by their terms and references. Whereas the grant we received from the council was a community grant supporting the initiative of the tenants of Waterloo, not a government department. How confident is he that the developers and NSW Government will take into account the WPHAG’s suggestions?